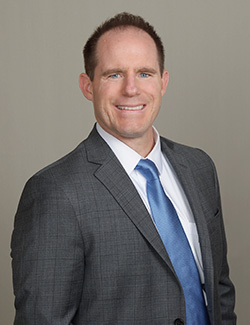 Devin J. Andriesen received his Bachelor of Arts degree in 1995 from University of California Santa Barbara in Law and Society. In 1998 he obtained his Juris Doctor from University of San Diego School of Law. Mr. Andriesen was admitted to the State Bar of California in 1999. Mr. Andriesen is a member of the State Bar of California and was an SBA Representative from 1995-1996. He is also a member of the California Bar Association, San Diego County Bar Association, and Sports and Entertainment Law Society. Prior to becoming a licensed attorney, Mr. Andriesen worked as a law clerk. After admission to the Bar in 1999, he served as lead attorney for the San Diego County District Attorney. In the Department of Child Support Services, Mr. Andriesen enforced child support liens at the Workers’ Compensation Appeals Board. He joined the firm of Dietz, Gilmor & Associates as an associate attorney in 2002 and continues in that position with Dietz, Gilmor & Chazen. His areas of practice are workers’ compensation, serious and willful, Labor Code Section §132a, and civil litigation.